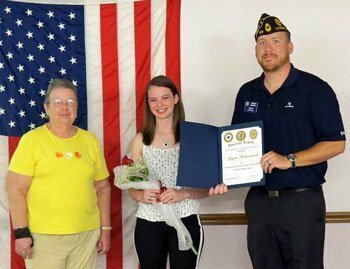 American Legion Post 125 Commander Jayson Massey, right, and Floy McElfresh, post Auxiliary president, left, present a certificate of recognition to Jayda Forkenbrock for her attendance at Girls State. American Legion Post 125, Lyndon, honored the local ladies Auxiliary appointee to Girls State with a dinner Aug. 11 at the post hall. Jayda Forkenbrock, Lyndon, spoke about her experiences at Sunflower Girls State, which was held on the campus of Washburn University, Topeka, June 1-6. The post hosted about 50 people for the Girls State dinner, including guests Lyndon Mayor Brandon Smith, American Legion District Commander Ezster Blair, Vice Commander Tom Tschantz and Sergeant-At-Arms David Blair. Everyone enjoyed a spaghetti dinner with beverages and desserts. Forkenbrock told about the importance of Girls State, activities she was involved in, and her itinerary at the sesson. The young ladies who attend learn about government, visit the capital building, and heard from many civic leaders, including the state governor. Girls State serves as an outreach of the American Legion Auxiliary and teaches young women responsible citizenship and love for God and country.